After my last post, I knew I was destined to make a dessert using my gluten-free graham crackers. It’s just the right thing to do. 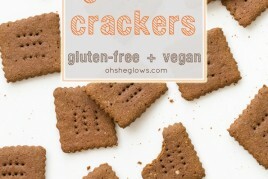 Plus, a girl can only eat so many graham crackers for breakfast! 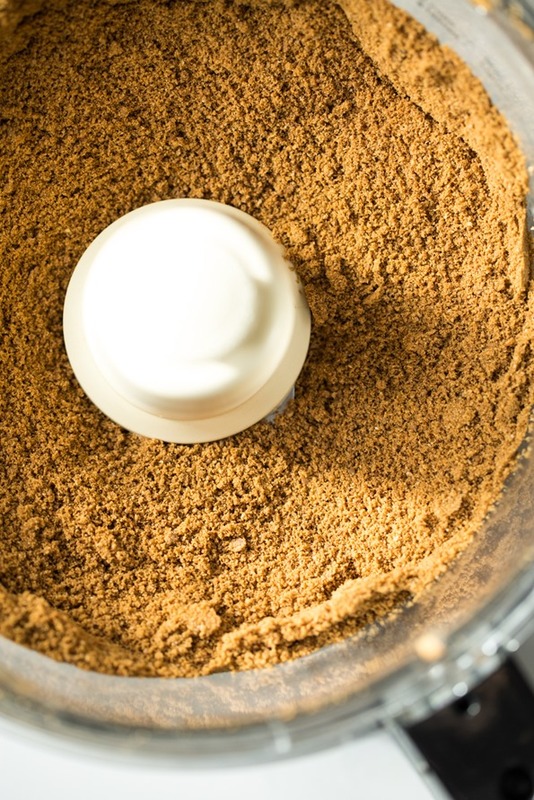 You can imagine how nervous I felt testing this recipe – not knowing if it would turn out – as I was risking the demise of my sweet, dear, homemade graham cracker crumbs. Thankfully, there were no graham crumbs harmed in the making of this dessert. 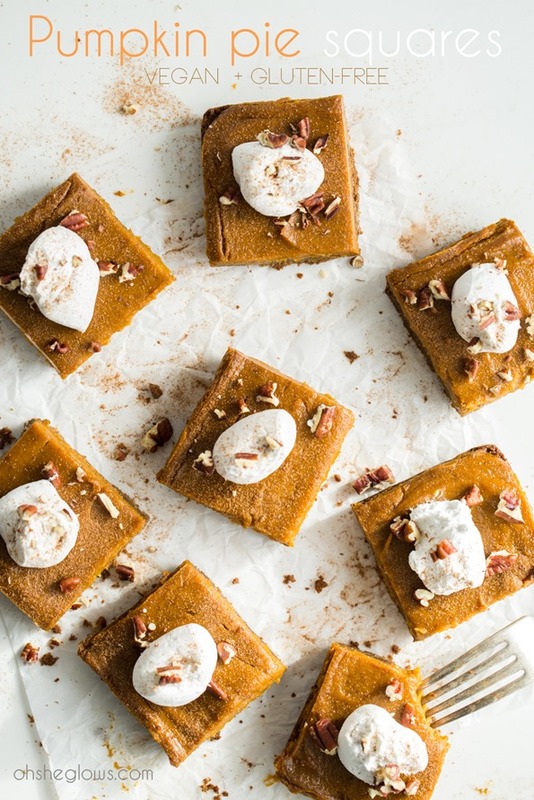 These pumpkin pie squares are the perfect solution when you don’t want to make an actual pie, but still want something similar that you can serve on the dessert table with a dollop of whipped coconut cream. Actually, this is one of the best pumpkin “pies” I have ever made, no matter how you slice it. The homemade gluten-free graham crust, oh that crust, is so flavourful and held together so well. It’s one of my favs. All you have to do is mix three ingredients and press it firmly into the pan. No stressing about pressing the crumbs up the side of a pie dish (am I the only one who stresses about that?) or rolling out a crust. The filling is a vegan spin on traditional pumpkin pie filling, similar to the filling in my previous pumpkin pie recipe. It’s soft and dreamy, like a beautiful pumpkin cloud. Instant homemade gluten-free graham crumbs, at your service! I dolloped coconut whipped cream on top and added a dusting of cinnamon and chopped pecans because I’m a fancy pants. I’m trying to save the leftovers for a get together this weekend, but it’s not looking good. 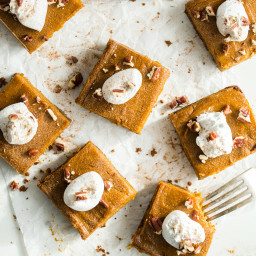 Easy to throw together, these pumpkin pie squares are a nice option when you don't want to make a traditional pumpkin pie. The homemade graham cracker crust is so flavourful and holds together well. The filling is a vegan spin on traditional pumpkin pie filling, enriched with decadent coconut cream. Be sure to make this recipe the day before so it can set overnight in the fridge. Preheat oven to 350F and lightly grease an 8-inch square pan. Now, line the pan with two pieces of parchment paper, one going each way. I like to spray the first piece of parchment paper with non-stick oil so the second piece sticks nicely and doesn't fall over. Prepare the crust: In a medium bowl, combine the graham crumbs, melted coconut oil, and sweetener until the crumbs are thoroughly coated in the mixture. Scoop the mixture into the prepared pan and smooth out evenly. Starting from the middle, press the crumbs into the pan firmly and evenly. You really want to press hard so the crust sticks together nicely. I use a pastry roller to roll the crust and compact it even more. Using your fingers, press in the edges until even. Pre-bake the crust, uncovered, for 10 minutes at 350F. Prepare the filling: In a small bowl, whisk together the arrowroot powder and maple syrup until no clumps remain. 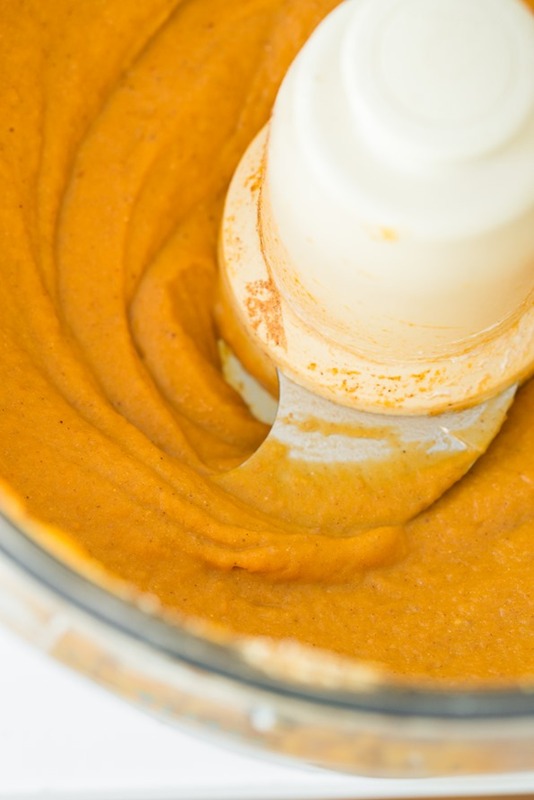 Add this and all of the other filling ingredients into a food processor and process until completely smooth, scraping down the bowl as needed. When the crust has come out of the oven, immediately pour this filling on top of the baked crust and smooth out as evenly as possible with a spatula. Bake, uncovered, for around 41-43 minutes at 350F until the filling has darkened slightly and it's semi-firm to the touch (although the filling will still be very soft and sticky!). Place on a cooling rack for about 60 minutes and then into the fridge to set overnight, or for at least 8 hours. Freezer lover's note: The freezer will expedite this process. Just sayin'. Store leftovers in the fridge or freeze for later. 1) I used my homemade gluten-free graham crackers and processed them into crumbs for this recipe. 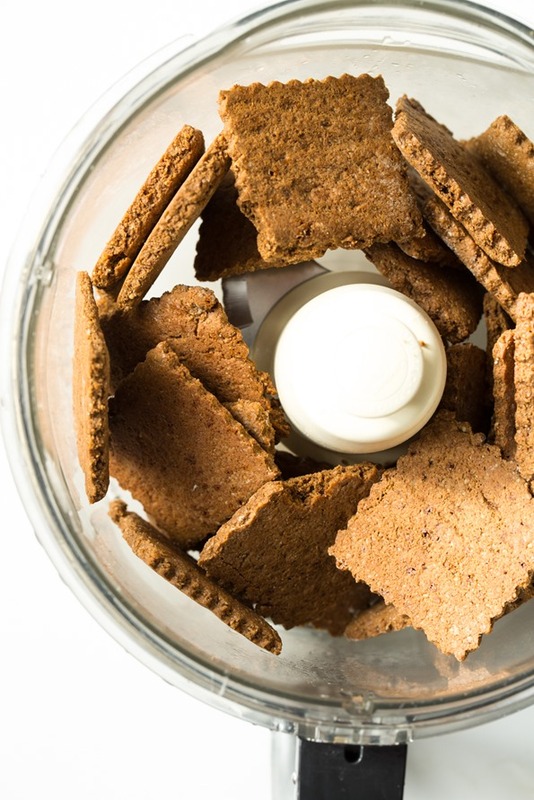 If you are looking for a non-gluten-free graham cracker (without nuts), you can also swap them for this graham cracker recipe or use store-bought graham cracker crumbs. 2) For the full-fat canned coconut cream: Chill the can overnight or for at least several hours before use. This is the white cream in the full-fat cans of coconut milk (such as Native Forest or Thai Kitchen brands). Do not use the water portion. Use the leftover cream for the whipped cream topping. For a how-to on Coconut Whipped Cream, see this post. Oh Angela, how I wish we were neighbors. I would be your willing recipe guinea pig anytime – these look Ah-mazing! Wow, Angela thank you so much for even taking the time to check out my blog! VERY much appreciated!! I am so excited for your cookbook to come out and I will hopefully be pre-ordering it on Amazon soon :) I want to start doing my own recipe tutorials, any advice? Thanks again! Angela, These look awesome! Can’t wait to try. I left a comment on your cookbook post, pg. 5……Have you had a chance to check it out? Love the look & taste of your recipes! Keep it up girl! Congrats on the cookbook – can’t wait. Oh man, I always stress about pressing the crust up the side of the pie pan. I can’t help but think gravity is working against me and something is bound to go wrong ha! But these look amazing Angela!! Can’t wait to give them a try. These look deeeeelicious! And now that you’ve pointed it out, I can totally tell a difference in your photography from last year. The lighting is much brighter and you seem to favour more detailed and overhead shots. May I ask what kind of set-up you use now (light-box, reflectors, etc?) You probably mentioned it in the past, but now I’m drawing a blank. It must be these chilly and dark 6pm evenings we’re getting. Miam, this look so delicious! Do you think I can use mapple syrup instead of brown rice? I’m not sure it will hold together as well, but you could surely try! I tried it with Maple syrup in the crust instead of brown rice syrup and it seemed to hold up ok. It was crumbly, but then it seems like graham cracker crusts are always crumbly (and also I haven’t tried the brown rice for a scientific comparison on crumblyness, so maybe I just don’t know what it “should” be like). Hope this helps! These look delicious — I love the pumpkin and molasses-y combination, too. Haha! “Sweet fancy Moses!” I’m just going to pilfer that expression to use in everyday speech if you don’t mind. I am a frequent proclaimer of “Holy Mosey!” However your colliquial update trumps my little old granny-ish expression with aces. Also, a great big Yay for Thanksgivukkah! Greenbeen cassarole with a latke top crust perhaps? It could be done! Great recipe! I am surprised how will it set up without eggs in the pumpkin “custard” part of the squares. Do you happen to have the nutrition info on these? These look goooood! Definitely want to try them!! I’m glad you recommend certain brands of coconut milk–I’ve been sorely disappointed by brands other than Thai Kitchen. Coconut milk can be such an iffy-thing. I’ve purchased some full fat coconut milk that has all the fat but none of the flavor :(. I’m hosting a Thanksiving party in about two weeks and have been worried about how to make pumpkin pie happen (currently living in Asia, only have access to a mini toaster oven and not a real one, some ingredients are tough to come by). This looks like SUCH a good option. Easier to serve to guests, easier to bake in a non-round pan. Genius! Thanks, Angela! These look amazing! I love how you keep it really natural!!!! Thank you for sharing your recipes!! Can’t wait for the cookbook. I’ve long wanted to try a coconut milk-based pumpkin pie filling. Wonder if it adds any coconut flavor? Will find out! These look absolutely divine. I will definitely be making these for our Thanksgiving gathering this year! These look amazing! We’re hosting Thanksgiving this year and I have been struggling with the menu (I am vegetarian but no one else is!). How do you think these would keep if made in advance? I am thinking of making them the night before—though looking at the picture makes me think the bigger issue would whether they would make it in the fridge overnight. They look irresistible! Sorry–I meant not the night before, but the weekend before Thanksgiving! So would it last a couple days in the fridge (assuming I can keep salivating mouths away)? Yes that should be fine! I expect they’d last in the fridge for up to 5 days. oh, how I love pumpkin! Can’t wait for Thanksgiving….will have to make these this weekend! Thanks for another winner! American here. I’ll be stalking you all month! ;-) My g/f bipolar teen just got out of the hospital for depression, and she needs these today to keep up her happiness and “mom’s caring for me” levels! Serendipitous timing. First the graham crackers.. now this recipe! Wow.. these look incredible! Perfect for Thanksgiving! Where do you buy Buckwheat groats? I’m in Milton, and have checked out Bulk barn, Whole Foods, Superstore…. nothing. Driving me crazy! Thanks! Yeah, I don’t think I would be able to make it to the weekend with these in my house. Holy deliciousness! A pumpkin cloud sounds like perfection. I wish you would open up a vegan cafe. I would totally fly to Canada just to come eat there! These are incredibly beautiful. I am not a particular fan of all things pumpkin (I like it sparingly), but this appeals to me. What a great creation! I think all I need to say is yum and yes, please! Those look so good! Definitely glad you risked the graham crackers to test that recipe out. Just made these, they are fantastic! I am the designated pumpkin pie baker for Thanksgiving and I am so excited I can now enjoy a vegan gluten free slice (or 2!!) myself. Any suggestions for non-coconut eaters? I’m allergic. Thanks! 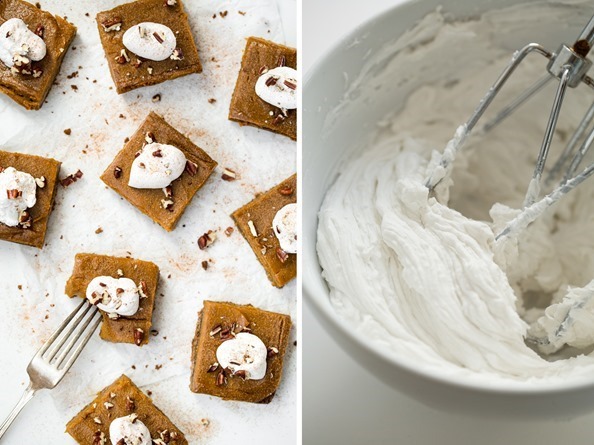 *Smacks forehead* – Oh the coconut whip cream goes IN the pumpkin filling concoction! I read “see note” beside the coconut milk in the ingredients list, so I looked above to your recipe write-up mentioning coconut whip cream as a topping, and figured that’s what the coconut milk was for. Also, I didn’t understand what you meant about using two pieces of parchment paper “one going each way”, and I just cut out one piece to the exact right side, and laid in on the bottom of my pan. I now realize that the reason for the two pieces is to have the piece larger than the dish, to hang over the sides, to easily lift out to place on the drying rack. Stay tuned, this ought to be interesting! I made this over the weekend and it is gone. It was so delicious! My husband really liked the crust made from your graham cracker recipe. We are making this again! Totally making these this fall! Thanks for the recipe! These look positively scrumptious! I have your enchiladas in the oven and will be whipping up a batch of these little delights tomorrow! 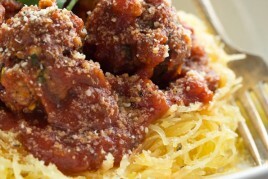 Thanks for this recipe (and all of the wonderful recipes you’ve shared with your blog). I am anxiously awaiting the arrival of your cookbook in stores! I have a huge pumpkin obsession right now & these will need to get made!! These turned out perfectly, even if I didn’t make them perfectly. The first can of coconut milk didn’t separate, neither did the second so back in the fridge they went and the pie filling and crust had to wait another day. Good news, both can wait in the fridge with no consequences! Once I got some cream (I think a week in the fridge would be a better guess at getting the cream to separate out), they baked up perfectly. I have developed egg and dairy allergies but ate both until last summer. I can assure everyone, this is better than a pie with evaporated milk and eggs! Thanks for working so diligently for all of us out here, we love you! Lovely recipe! I made these last night and had (more than) a few bites after just letting it cool on the counter for an hour. It was good, but not as good as I expected….I stuck it in the fridge overnight and this morning it is SO GOOD! I’m very pleased. One question: My crust came out very thick. So thick, that next time I make this recipe, I’ll probably only use 3/4 or half of the crust mixture. I’m not gluten free, so I used regular store-bought graham crackers for the crust, I used brown rice syrup and whole foods regular “365” coconut oil. Did I do something wrong? I used an 8×8″ square pan, so it’s not that I used a too-small pan. Any thoughts? Thanks for a great recipe! Keep them coming! Our daughter adores vegan pumpkin pie, so I think I will turn this into a pie for her this Thanksgiving. Thank you for sharing your beautiful talents. These were so good! I did a trial-run for Thanksgiving last weekend, and they were gone the same day. However, for Thanksgiving day my family insists the pumpkin “pie” must look more like a pie (to them, this means double the height of the filling and make it in a round pie pan). Have you tried making this shape? Would you guess that doubling the filling would require a longer (and lower) baking time/temp? These are in the oven for my Thanksgiving party tomorrow as I type this message. My studio apartment smells like heaven. I couldn’t stop scooping out bits of the pumpkin filling from the blender. It tastes so darn good. Hi Angela! Quick question.. I really want to make a pumpkin pie and use your filling. Do you think this would work, if I put it in another crust recipe? I wanted to make a full pie. Thanks so much. I absolutely love your recipes! Hi Miranda, I do think it would work, although I would probably bump up the arrowroot powder to 2.5 Tablespoons so it holds together better. I made these last night for a Thanksgiving celebration. Such a hit! It’s hard to believe these are gf/df. The texture and flavors are so lush and the baking process was actually pretty painless (I’m not the most reliable person in the kitchen). Thanks for sharing! The graham crackers are great! I would like to use this crust recipe for a pie. Just wondering if you or anyone else has tried using the uncooked graham cracker dough as a pie crust on its own without making it into crumbs first. Meaning, press the uncooked graham cracker dough into a pie pan and fill with a pumpkin pie filling. I cannot think of a reason for it not to work. Thanks! Wow, these bars are fabulous! My 15 year old daughter whipped up a batch for my family today – everyone loved them. Will definitely make them again! I had no doubt from the beginning that they would taste fabulous! Cannot wait to buy your cookbook! Angela you rock! I’ve never made anything vegan or gluten free. My sister has a medical condition that requires her to eat vegan, gluten free and wheat free. Unless she makes her own dessert for thanksgiving, she won’t get dessert (one of the best parts of thanksgiving!). 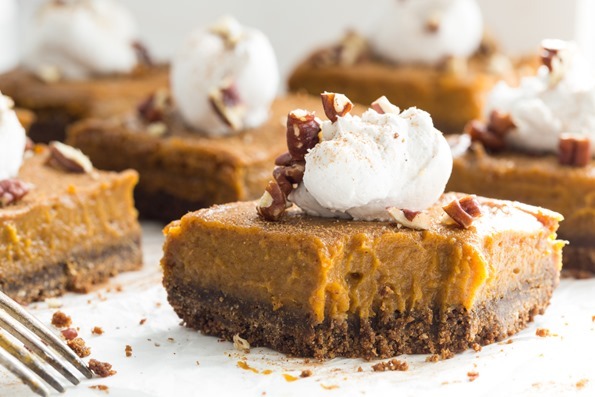 These graham cracker pumpkin pie squares look delicious. Could anyone tell me if they are wheat free, or if there is a way to make them wheat free? I know this is probably a naive question, but any help would be very appreciated! Happy holidays! Hi Ben, Yes they are wheat-free too :) Anything that is gluten-free should be wheat-free as well. Note that they are not grain-free though. Hi! I was just wondering if I took the filling part and made mini pies how you think that would work… I have a crust recipe already. Thanks! I made these and they were awesome! The only thing is that my crust was too thick – is it 2 cups graham cracker crumbs, OR 2 cups of graham crackers (broken up a little to fit into a cup to measure) and then processed into crumbs? Thanks in advance for clarifying help! Hi! We are planning on making these for Thanksgiving because they look so good! Regarding the coconut oil, do I measure 1/4 cup then melt it, or melt some coconut oil and then use 1/4 cup of melted oil? Thanks! Measure 1/4 cup and melt it after measuring. Hope this helps! I would like to make these delicious bars into individual mini-pies. What time & temp would you recommend these being baked at? Thank you! These were a big hit with my husband and I. I’m making them again now for Thanksgiving. I didn’t do the graham cracker crust but instead did a spin off on Pure Food and wine’s raw nut crust with 1 cups of pecans, 1 cup of almond flour, 3-4 heaping TB of dates, pinch of salt, some agave or maple syrup and 1/4 cup coconut butter. I didn’t precook the crust but just poured the filling over it and it was fantastic! Once again, another INCREDIBLE recipe for Angela! (: The pumpkin filling is perfection. I unfortunately wanted to use a simpler “crust.” If I had followed the recipe completely they would’ve been perfect! I had difficulties with the coconut whip cream, but I let it set up overnight to harden. Thank you very much! I made these fir thanksgiving and everyone loved them!!! I personally loved the thick graham crust!!! I made your recipe into a pie this Thanksgiving for my dairy/gluten/egg/soy free kid. I had a few store bought g/f graham crackers so I bulked up the crust with a handful of pecans. It came out amazing! Thank you so much! We had a wonderful Thanksgiving meal all thanks to you! We made the lentil walnut balls with the cranberry and for dessert the pumpkin squares. It was all amazing! We can’t wait to buy your cookbook! I made this for Thanksgiving and it was a big hit. The carnivores were worried that the only pumpkin pie was from the vegan girl. I used GF graham cracker crumbs from the store, but I was making a double batch, so I added pecans to the crust to stretch it a bit. I was more generous with the spices also. It was great, everyone loved it. I made the coconut whipped cream for it as well. I had some problems with this one though. The recipe is great, it was the cans of milk I had the problem with. After hunting them down at two different stores, I ended up with two different brands. I put them in the fridge the day before, and when I opened them only one did the separation thing. The other one was just thick milk, with no hardened cream. The one that did work beautifully was the Thai Kitchen brand. Thanks for this recipe, I will use it again!! I cheated and used pre-made GF vegan graham crackers for the crust, but these are seriously PERFECT! I made them for Thanksgiving at my boyfriend’s family’s house, and everyone loved them. No one could believe they were GF and vegan. I served them with pre-made rice whip, which made them even better. They were claimed to be the best pumpkin pies ever, and I have to agree; the filling is top-notch. I subbed agave for the brown rice syrup in the crust, which worked just fine! No crumbling! Thanks for a great recipe! oh my god I think I would be able to make it will be tomorrow! I love your blog. I love that so many recipes are gluten free (I have Celiacs). I served the pumpkin bars with whipped coconut cream. I added some vanilla, maple syrup, and pumpkin pie spice. My husband couldn’t get over how delicious it was. Said it was better than dairy whipped cream. I made another batch of the graham crackers yesterday and put acan of coconut milk in the fridge. 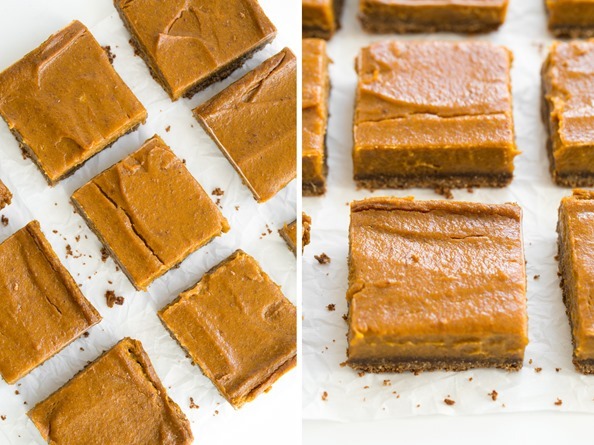 Can’t wait for more pumpkin bars! 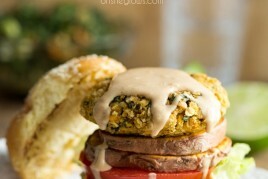 Thank you so much for great vegan and gluten free recipes like these! Can not wait for your cookbook! These are awesome! I subbed the graham cracker crust for the Sweet and Salty Pecan crust though… I made that one with my pumpkin pie at Thanksgiving and LOVE that crust! The pumpkin filling for these bars was excellent as well. A great treat, and no one knew it was vegan and healthy until afterwards! I whipped up the coconut cream too. I used powdered sugar and a splash of good vanilla extract. I thought it had kind of a strange taste (though everyone else loved it), but I think I’ll use maple syrup next time for a little more flavor boost. All in all – great recipe and I’ll definitely make it again! I just made these wonderful pumpkin bars. They turned out really well. I made some changes. I used a can of Farmer’s Market brand organic pumpkin pie mix instead of just plain puree. That saved a lot of time adding the spices because it is all in there already and I did not have to add any sugar. I cut the amount of maple syrup in half and it is fine. Next time I make this, I may use two cans so it is a little thicker. For the crust, I used 1 1/2 cups gluten free graham cracker crumbs and 1/2 cup ground almonds. The crust came out really well. I was worried- but it is really good. I wonder if I could cut the amount of coconut oil when using the ground almonds? I would recommend that if you use the pumpkin pie puree and you are going to make the whipped cream- go very light on the sugar. It is very sweet already! Hi Angela! Do these freeze well? I had to find another of your “pumpkin pie” recipes so I could comment on one that has been closed to comments. I made your Brownie Pumpkin Pie with Crunchy Pecan Topping last night and we had it after dinner tonight. It was fantastic!! I used whole wheat pastry flour instead of all-purpose, coconut palm sugar instead of cane and walnuts instead of pecans. I’m thrilled to be adding this to my recipe box!! Many thanks Angela!! THESE ARE THE MOST AMAZING PUMPKIN TREATS IN THE WORLD. I made these (using store-bought GF vegan graham grackers) for a group of friends with your coconut whipped cream recipe and they were devoured within about an hour. One of my friends actually said this was the best dessert she has ever had in her entire life. This is definitely one of the best desserts I have ever made in MY entire life too- and it easier than I anticipated! I am bookmarking this and will be making it many more times!!! My only notes are that I personally had to cook mine for 45 minutes and thought the crust was a bit thick (I didn’t look at the picture closely enough) so I’d reduce the crust a bit. Other than that, it was perfect!! Would you mind if i used your recipe for my school food blog? it sounds so YUMMY! Made this last night for Thanksgiving today. They were awesome! Everyone loved them. Instead of using cream on top, I cut the squares much smaller and put a whole pecan on each pumpkin lite. They ended up being bite sized pumpkin/pecan bites and were amAzing. I also made your sweet potato casserole and it turned out awesome too! That’s for the recipes! Absolutely the BEST pumpkin dessert ever!! I made this for thanksgiving and no one would’ve guessed it was vegan. I think I mi make this a year round dessert. I can’t say enough good things about these. So delicious and easy!!! 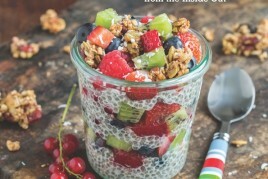 Trying this recipe right now! Decided to just use the filling recipe to make a couple of pies with a normal graham crust. The filling smells and tastes amazing, just waiting to see how it bakes and turns out :). I also added a 1/2 tsp of pumpkin pie spice (because I bought some already beforehand). Definitely recommend this one! i could have easily eaten that pie filling as pudding, but the combo with the graham cracker base (i actually used ginger snaps) was DELISH. What are your thoughts on using coconut sugar in lieu of cane sugar? May I replace arrowroot with cornstarch? I do not have arrowroot powder at home, and I could not find it in the store. Mine is still in the oven and it has been an hour. It is not setting up…. I hate it when this happens. I just reread the recipe. I thought I read teaspoons of arrowroot powder. My fail. I completely forgot that I was supposed to start this last night and now I’m in a time bind. Do you know how long it’d take to set if it goes in the freezer? Hi Angela- I have your cookbook an am going thru the recipes, we have enjoyed everyone thus far. I did try this Pumpkin Square recipe at our 2015 Thanksvegan Dinner and they were delicious, loved by everyone!! I did not have vegan graham crackers (nor had I made any yet) instead I made a vegan shortbread crust, which worked out nicely. thank you again for all the great recipes and delicious inspiration, keep up the good work!! I just made this pumpkin pie yesterday. I did not use the parchment paper as you suggested, and part of the crust stuck to the pan, even with the oil I used as a base. Do you think the parchment paper was successful? I was afraid it would get stuck into the crust and I’d have a hard time ripping it off. I’d like to find out how it went before trying it with the paper. Thanks! It was delicious, in any case. Nice and refreshing. I used packaged graham crackers that I ground up. Hi June, I’m sorry to hear you had troubles with the pie crust! Parchment paper works great for baking–usually it peels away super cleanly. If you give the recipe another try with the parchment, I hope you have better luck! Hi, thank you for this recipe. I am new to vegan cooking, I have a daughter who has been vegan only a year. I need to make this recipe but I would like to use Agar Agar instead of arrow root. Will that work? I cannot wait to make these today! For the crust, is it a measured 1/4 cup solid coconut oil and then melted, or melted oil then measured using a 1/4 cup? I hope this makes sense, thanks for your help! I am lazy so I made the filling and poured it into a prepared graham cracker crust. The filling set up really well. It is very soft when you pour it in, but don’t worry! It will set! If I made it the “lazy” way again, I would use a pastry crust instead of the graham cracker. The graham crust didn’t hold up very well. Other than that, will definitely make again! Maybe just throw in a larger amount of each spice as I prefer stronger flavors. This was amazing! I made it for Christmas dinner and there was not a crumb left in the pan. I used store bought gf graham crackers and maple syrup. It worked great. Thank you!!!! Half my family was not left out of dessert!!! I recently made these bars,I was a little disappointed in how hard my crust turned out. The guests said they didn’t mind but was wondering how I could avoid this? It was okay to hold the bar and eat but couldn’t break it with a fork. Hey Alanna! I’m so sorry you found the crust a bit too firm. I have a couple ideas: 1) You could try baking it for less time next time, or 2) you could try using a less “firm/dense” liquid sweetener, such as maple syrup which is more runny. Coconut nectar and brown rice syrup are both quite dense sweeteners, so my guess is that maple syrup which is much less binding may crumble more easily. Which sweetener did you use? oh okay good to know! also very thrilled to hear back from you so soon! No problem! :) I have the comments going into moderation now because this way I don’t miss any and I can answer everyone’s questions much more easily. I would love to make these for Thanksgiving this Thursday but am really confused about the coconut cream instructions! The filling recipe calls for 1/4c of full fat canned coconut milk, but then the not mentions whipping the cream and THEN using the extra for whipped topping. But the recipe doesn’t mention whipping the coconut cream for the filling. Do I add the coconut cream straight up for the filling and then whip the rest? Or am I whipping all of the coconut cream and adding some of the whipped product to the batter? Help!! Can I also use soy or hemp milk? Hey Lisa, I think swapping the 2 tbsp almond milk for soy or hemp would be fine! I would probably suggest keeping the full fat coconut cream in there if at all possible since it adds to the richness of the filling. Hope this helps! Next post: Things I’m Loving Lately – November Edition!